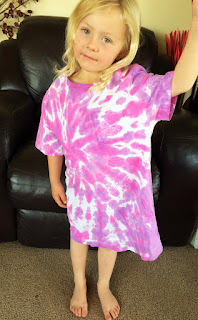 Why Pay for expensive fabric dyes when you can use acrylic paint to change up items of your clothing that are looking a bit faded or have a stain or discoloured. You can mix any colour you can dream up, and apply it any way you want to. I haven't done Tie Dye since I was in school so I wanted to have another play with it. Here is a rejuvenated Tshirt that was long and narrow that we will use as a nightie. This was a lot of fun, and now I am looking through our drawers for more items we can play with. 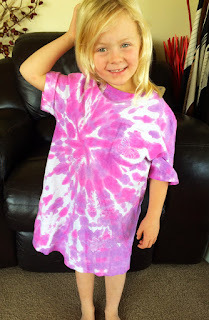 Check out How to Tie Dye With Pebeo's Acrylic Paint and Stencils. by Siann Watts on Snapguide.